Our first experience with toddler biting is something I won’t forget. For some reason, we, as a society look at a toddler who bites as deviant behavior. I don’t totally understand WHY we see toddler biting as somehow worse than a toddler hitting, kicking, or screaming – but we do. Maybe it’s because it is just kinda…gross. Our toddler has been in some sort of daycare environment since she was eight months old. She was a year and a half when we got the call that someone had bit her. As the parent of the toddler who got bit – I was slightly horrified. That daycare provider and I were very close, and we ended up having some conversations regarding biting toddlers, and the kids she had dealt with over the years. We experienced a period of our toddler biting for a couple of months. As the parent of a biting toddler, I can tell you I GET how embarrassing it is, and how helpless we can feel as parents. There may be affiliate links in this article. You can read about this in my disclosure. IS BITING COMMON IN TODDLERS? 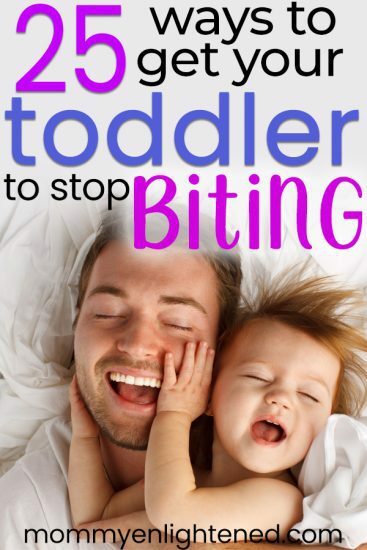 It’s important to remember that biting is TOTALLY normal in a toddler. Many toddlers have a biting period between the ages of one and three. In fact, a study examining the prevalence of biting in daycares showed us that it is incredibly common. Perhaps more common than other undesirable behaviors, such as hitting or kicking. Preventing toddler biting largely depends on the underlying reason it is happening in the first place. Once you understand that, you can better prepare to keep it from happening in the future. Here are some of the most common biting triggers and what you can do to prevent your toddler from biting. Before things get to the point where you have to shop around for a new provider, try and spend some time observing your toddler in daycare. This is not a possibility for all parents, but this can often help understand the trigger behind the behavior. At home, make sure you are keeping a consistent schedule where your toddler gets a good amount of sleep. Make sure you have a good understanding and are on the same page as your child’s daycare regarding how they respond. The last consideration is that the daycare may not be a good option for your child (and that’s okay!) Our children are unique and need different things – sometimes it’s just a bad match. If you feel this is the problem, try and pinpoint what about the environment is triggering for your child. Is there too much structure? Not enough? Do the discipline styles vary wildly from your own? Once you have an idea of WHEN they bite at daycare, you can address it through one of the solutions below. If your toddler bites because they are experimenting with the behavior, the most important thing is to stay calm and firm. They are trying to get a reaction from you, as they want to understand the cause and effect of everything in their world. When this happens, let them know “I will not let you bite. Biting hurts”. If they are an older toddler, you can elaborate on this more. Just be sure that you don’t give it a lot of attention. Learning emotions is a long and complicated process for toddlers, so it’s important to start building that foundation now. Start teaching them HOW to put those feelings into words. Say “You seem really angry that you can’t have a cookie”, or “You seem frustrated because you don’t want to share that toy right now”. If your toddler seems angry, suggest ways they can deal with it appropriately. Whether that’s punching a pillow or making angry faces, you need to give them an alternative to biting. For my toddler (she’s a screamer when she’s really angry) we tell her she can scream into a pillow or jump up and down. I think the thing that has worked best with our toddler is teaching her to ask for space when she needs it. If she is starting to feel really angry, she is able to identify that she needs some space for a minute (we are super impressed with this!) She walks away and comes back a few minutes later. It’s also important to teach them words like “no” and “stop”. They need to be able to communicate their boundaries with others – as a breach in boundaries could lead to biting or other aggressive behavior. Your toddler may be a little young to get this one, but start introducing the language now. When they DO put their feelings into words, praise them for it. Although sometimes it WILL be ridiculous (angry because they can’t take another child’s toy home), it’s important to encourage this behavior. If your little one has some developmental issues related to speech, teach them sign language. Not being able to communicate is very frustrating, so it’s definitely worth finding some way for them to be able to. A toddler biting because they are teething is not super common, it can still happen with younger toddlers (although it usually evolves into experimentation or attention-seeking). If you believe your toddler is biting due to teething, make sure that you always have some teething rings on hand. If your toddler goes to daycare, make sure that they have a supply too. Some toddlers bite because they see other kids do it. The response to this needs to be similar to the response of a toddler who bites for experimentation. A calm and firm “I won’t let you bite, biting hurts” is often enough. Don’t create a situation, or you may have a harder time breaking your toddler of the behavior. It can be tricky to deal with a toddler biting for attention. First and foremost – make sure that your response to them biting is somewhat minimal. You definitely need to DEAL with the situation – but you don’t need to give it more energy than it deserves. To help prevent these situations from happening, find more opportunities to praise your toddler for good behavior. Take some extra “special” time in your day and see if the behavior resolves. At this age, it’s already more about the QUALITY not QUANTITY of time spent with your child. Try and give them an extra twenty minutes a day of your undivided attention. This could go a long way. Some toddlers become overwhelmed by crowds, sounds, or lights. If these sort of situations seem to trigger your toddler, plan accordingly. If a toddler bites mom at the crowded grocery store, try and schedule your shopping for earlier in the morning, when it’s less busy. Make sure your child is well-rested apt>nd well-fed before you go. You can take the above idea and apply it to other stressful situations. Your toddler doesn’t like loud noises? Keep the TV and radio down. Sometimes toddler biting is due to excitement. A minimal and firm response is best during this situation, as your toddler may be surprised to learn that biting actually HURTS you. Try and redirect quickly and show them other ways to express their excitement. Jump up and down, dance, clap, or sing. If you can figure out that your child only bites Richard when he takes your child’s blanket, you can take steps to ensure that your child doesn’t end up in a situation where they feel an urge to bite. Make sure that your toddler knows how to say “no!” and encourage them to ask an adult for help. When they do, make sure you praise them for it. Some toddler’s bite when they are overtired or hungry – which makes for a cranky toddler. Make sure that your toddler is sleeping a consistent 12-14 hours in a twenty-four hour period. IF they are not, move up bedtime a little, or increase nap time. Some toddlers bite because they have an oral fixation. To curb this, offer your toddler snacks throughout the day. Learn to recognize what precedes your toddler biting. Once you can recognize the signs, you can be prepared to step in and prevent biting from happening. Children will internalize these “labels”. They are dangerous to use. I was SHOCKED to hear that there are parents out there that think this is a good idea. I mean…really?! That’s until I was bit by MY child. Let’s just say I understood the impulse a little better. I still have never bitten my child (and I HOPEFULLY never will!) Violence should not equal violence. It’s a tad hypocritical, and teaches your kid it’s okay to respond to problems with violence. She then giggled and tried to bite me again. In that moment…I kind of wanted to bite her back. I didn’t of course – but I’m saying I know how difficult it can be to stay calm. If you freaked out a little the first time your kid bit you, oh well. Just don’t freak out again. Toddlers are curious, so when they see you act out of character they will try and recreate the situation. If you stop creating drama around biting, they will stop seeking to understand your reaction. Physical punishment of any sort has not been shown to reduce biting. In fact, your child’s behavior may worsen. Harsh reactions can increase your toddler’s level of fear or anxiety instead of teaching them HOW to deal with frustration or anger. 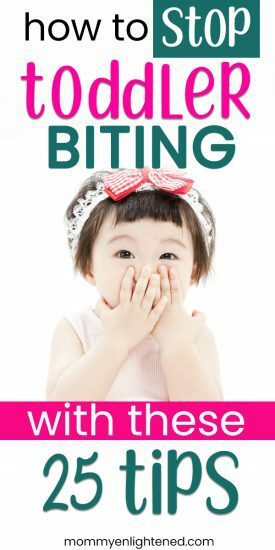 Toddler biting is problematic for many reasons – and decoding this is the first step to solving the problem with your biting toddler. What is going on when my toddler bites? How do I (or other caregivers) respond when my toddler bites? Answering these questions can help decode the underlying meaning, which we have listed below. My toddler biting started as experimental. I don’t typically go around biting my children, so she had not made the connection between biting and the resulting pain. She did enjoy exploring things with her mouth, however, and this was simply another means of exploration. Your toddler is trying to understand their world. If you are dramatic or loud with your response to biting, your little scientist will try and recreate the response, so they can better understand it. Your toddler speaks in actions more fluently than words. This means they use sounds and actions to communicate their thoughts and feelings. Biting is just (unfortunately) another way they can express their needs and desires. Your toddler may be biting because they are scared, frustrated, or feeling crowded. This is where the question of “when is the biting happening” comes into play. Are they biting at daycare because they feel overwhelmed by the number of kids? Is your toddler biting after skipping a nap? This is a sign that your toddler has some pent up emotions that they cannot yet articulate. They can, however, express themselves with behaviors such as biting. A toddler biting at daycare can be incredibly problematic. As stated earlier, it’s just one of those things that society views quite negatively. Daycare providers often feel a lot of pressure to deal with a biting toddler appropriately – it’s a sensitive subject for EVERYONE involved. It can be SO hard as a parent on either end of the situation. We all want to protect our kids from getting hurt and to be a positive influence in their lives. With a toddler biting at daycare, it’s even more important to understand the situation where this happens. Find out what precipitated the biting. Did another child try to take a toy out of your child’s hand? Is your toddler overtired? Was there a change in routine? These are some of the most common triggers of a toddler biting at daycare, and understanding the root will help you absolve the behavior. You may be asking yourself if a daycare can kick your child out for biting, and the answer is yes. Now, this doesn’t mean they WILL kick your toddler out. Our first (amazing!) daycare provider let a biting child stay for a period of time. She found a way to limit his negative interactions with other kids and worked on the behavior with him. Not all providers can or will do this. Biting has its own risks associated with it. Studies have shown that virulence is more of a risk with human bites than animal bites – so it becomes a safety concern. Although this is less likely the reason for your toddler biting (whereas you can definitely see this with baby biting), it’s still a possibility. Remember that biting something (or someone!) relieves the pain brought on by aching gums, so biting is a very natural response when teething. If your child is past the age where they SHOULD still be teething – take your toddler into a dentist. According to Staci Perry, a Mental Health Counselor, parents don’t always remember how important dental care is for their toddler – even though they are very young. Toddlers can still get cavities and have other dental issues if parents are not consistent with dental care. Your toddler is learning about their world through their daily observations. If your child is in a daycare where other children bite, they are more likely to start biting as well. This is especially true if the biting they witnessed resulted in a theatrical response from the caregiver. A toddler will sometimes resort to biting if they don’t feel they are receiving adequate attention from you. You are the single most important influence in their lives. Feeling like they aren’t receiving enough attention can lead to feelings of insecurity and sadness. These kids will do whatever works to get your attention – even if it’s negative attention. Examine your life over the last few weeks (before the biting began). Has there been a change in schedule? Have you been less present? Have you been under a lot of stress? Although your toddler can’t enunciate words eloquently (yet!) they are still incredibly intelligent. They can feel when something is off, and they will often ask for more attention in these moments to help them feel more secure. Your toddler may be biting due to a negative feeling that they don’t know how to cope with. Anxiety, being bored, or not being able to cope with life’s ups and downs may lead to biting instead of finding other ways to express themselves. Some toddlers begin biting when there is a dramatic shift to their daily lives (which is part of the reason why consistency and a good toddler schedule are so important). Birth of a sibling, moving, or the absence of a parent can also trigger the bad behavior. This truly goes back to the idea that your toddler bites because they don’t know how to appropriately express their emotions. They feel a bubble of excitement and can’t contain it – so now your toddler is biting for fun. Often these children are as surprised by the pain caused as the person who got bit. At the moment that your toddler is biting, there are definitely some right and wrong ways to handle it. First and foremost – check yourself. It’s important to make sure YOU don’t respond emotionally (unless you reaaaally want this biting thing to be a thing!) I had a REALLY hard time not acting upset the first time my toddler bit someone. I probably didn’t do a very good job of hiding it honestly. We are only human, but checking our emotions before engaging can help avoid a scene. The appropriate steps are listed below. Separate the two children. Having a second adult is ideal, as you have one of you remove the toddler who bit from the overwhelming/frustrating situation, and comfort the child who was bitten. Comfort and provide first aid to the child who was bitten. If you are the only adult present, deal with the child who was bitten before the toddler who bit. Hopefully, this does not include soap, water, and band-aids (but it might!) Doing this is good for a couple of reasons. Not only is the obvious safety and health reason important (because toddler bites are dirty and can REALLY hurt!) but it showcases empathy and diverts the attention away from your toddler. Since we know that many toddlers bite to GET attention, this limits the positive reinforcement of a bad behavior. The cause and effect are not what your toddler was hoping for. It’s important to address your toddler’s behavior as soon as possible. Since younger toddlers can’t remember what they had for breakfast most mornings, you can’t really expect them to make the connection between the biting behavior and a later consequence. Once they are little older you will find this improves (my toddler remembers and points that I said a bad word a week and a half ago), but that takes time. Addressing your toddler’s behavior also means addressing the underlying reason the biting occurred. Did your child bite after a friend took a toy away? Remember that your toddler does not want to intentionally hurt another person, and often a toddler who bites is just as scared as the toddler who was bitten. Say something like “You seem angry. It’s not nice to bite when you are angry. It is okay for you to come ask mom for help”. Identify emotions and use “positive” language (like nice instead of bad) so that the message conveyed is constructive rather than punitive. Do not try and make your toddler feel guilty for the behavior – it probably won’t work. Toddlers are able to start exploring the concept of empathy around age two, but it is a looong time before they actually have an understanding of it. If you aren’t in a situation where you can talk about it, it is acceptable to firmly tell your toddler “no biting”. We know responding dramatically can result in what we DON’T want, so be sure to stay calm. The advantage to this approach is that it is easy for your toddler to understand the main message – that they CAN’T bite. Younger toddlers will understand the message easier, but it’s still important to practice identifying emotions because that is what will help them grow into appropriate emotional responses to things. Once the situation has been dealt with – move on. While redirection to directly deal with a conflict is usually NOT the right response, it’s important to switch focus once a situation has been dealt with. If your toddler biting seems to not improve or worsen, keep your pediatrician in the loop. There are a couple of different underlying conditions that could be contributing to the biting problem – so it’s a good idea to rule them out. Regardless of the reasoning for your toddler biting, remember that it’s a stage that will almost always pass. Since we don’t typically see adults walking around biting people, we can be pretty sure of that. Handle your toddler with patience, respect, and understanding and it’ll get better. I promise.